Cellular respiration can be controlled at each stage of glucose metabolism through various regulatory mechanisms. Explain the mechanisms that regulate cellular respiration. Varying forms of the GLUT protein control the passage of glucose into the cells of specific tissues, thereby regulating cellular respiration. Reactions that are catalyzed by only one enzyme can go to equilibrium, which can cause the reaction to stall. If two different enzymes are necessary for a reversible reaction, there is greater opportunity to control the rate of the reaction and, as a result, equilibrium is reached less often. Enzymes are often controlled by binding of a molecule to an allosteric site on the protein. Various mechanisms are used to control cellular respiration. As such, some type of control exists at each stage of glucose metabolism. Access of glucose to the cell can be regulated using the GLUT proteins that transport glucose. In addition, different forms of the GLUT protein control passage of glucose into the cells of specific tissues. Glucose Transport: GLUT4 is a glucose transporter that is stored in vesicles. 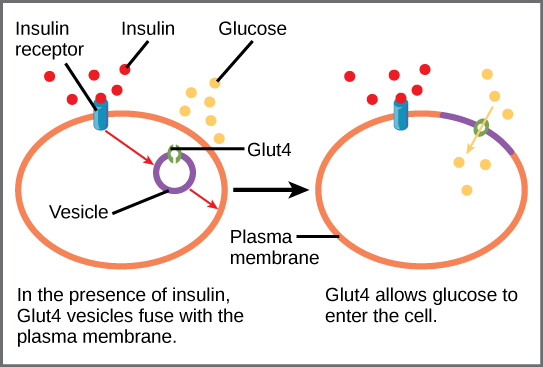 A cascade of events that occurs upon insulin binding to a receptor in the plasma membrane causes GLUT4-containing vesicles to fuse with the plasma membrane so that glucose may be transported into the cell. Some reactions are controlled by having two different enzymes: one each for the two directions of a reversible reaction. Reactions that are catalyzed by only one enzyme can go to equilibrium, stalling the reaction. In contrast, if two different enzymes (each specific for a given direction) are necessary for a reversible reaction, the opportunity to control the rate of the reaction increases and equilibrium is not reached. A number of enzymes involved in each of the pathways (in particular, the enzyme catalyzing the first committed reaction of the pathway) are controlled by attachment of a molecule to an allosteric (non-active) site on the protein. This site has an effect on the enzyme’s activity, often by changing the conformation of the protein. The molecules most commonly used in this capacity are the nucleotides ATP, ADP, AMP, NAD+, and NADH. These regulators, known as allosteric effectors, may increase or decrease enzyme activity, depending on the prevailing conditions, altering the steric structure of the enzyme, usually affecting the configuration of the active site. This alteration of the protein’s (the enzyme’s) structure either increases or decreases its affinity for its substrate, with the effect of increasing or decreasing the rate of the reaction. The attachment of a molecule to the allosteric site serves to send a signal to the enzyme, providing feedback. This feedback type of control is effective as long as the chemical affecting it is bound to the enzyme. Once the overall concentration of the chemical decreases, it will diffuse away from the protein, and the control is relaxed. Catabolic pathways are controlled by enzymes, proteins, electron carriers, and pumps that ensure that the remaining reactions can proceed. Glycolysis, the citric acid cycle, and the electron transport chain are catabolic pathways that bring forth non-reversible reactions. 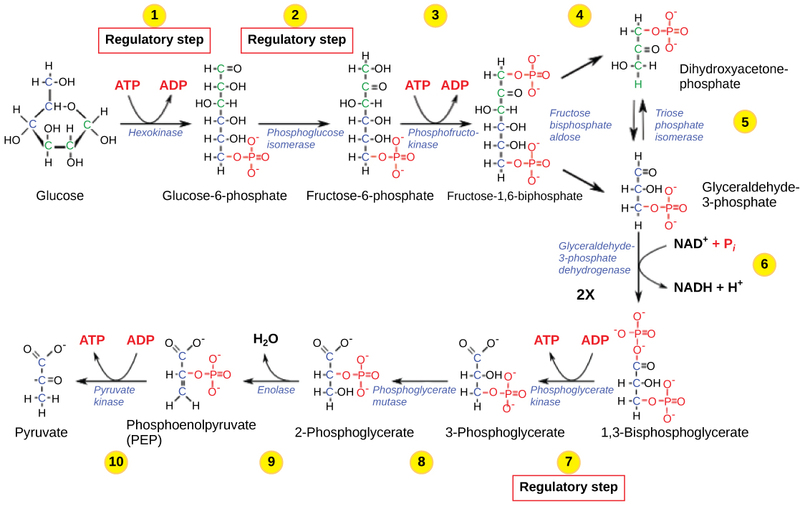 Glycolysis control begins with hexokinase, which catalyzes the phosphorylation of glucose; its product is glucose-6- phosphate, which accumulates when phosphofructokinase is inhibited. The citric acid cycle is controlled through the enzymes that break down the reactions that make the first two molecules of NADH. The rate of electron transport through the electron transport chain is affected by the levels of ADP and ATP, whereas specific enzymes of the electron transport chain are unaffected by feedback inhibition. Enzymes, proteins, electron carriers, and pumps that play roles in glycolysis, the citric acid cycle, and the electron transport chain tend to catalyze non-reversible reactions. In other words, if the initial reaction takes place, the pathway is committed to proceeding with the remaining reactions. Whether a particular enzyme activity is released depends upon the energy needs of the cell (as reflected by the levels of ATP, ADP, and AMP). The control of glycolysis begins with the first enzyme in the pathway, hexokinase. This enzyme catalyzes the phosphorylation of glucose, which helps to prepare the compound for cleavage in a later step. The presence of the negatively-charged phosphate in the molecule also prevents the sugar from leaving the cell. When hexokinase is inhibited, glucose diffuses out of the cell and does not become a substrate for the respiration pathways in that tissue. The product of the hexokinase reaction is glucose-6-phosphate, which accumulates when a later enzyme, phosphofructokinase, is inhibited. Glycolysis: The glycolysis pathway is primarily regulated at the three key enzymatic steps (1, 2, and 7) as indicated. 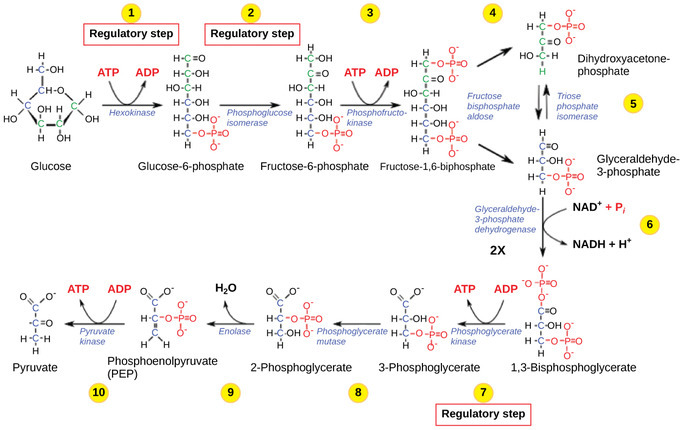 Note that the first two steps that are regulated occur early in the pathway and involve hydrolysis of ATP. Phosphofructokinase is the main enzyme controlled in glycolysis. High levels of ATP, citrate, or a lower, more acidic pH decrease the enzyme’s activity. An increase in citrate concentration can occur because of a blockage in the citric acid cycle. Fermentation, with its production of organic acids like lactic acid, frequently accounts for the increased acidity in a cell; however, the products of fermentation do not typically accumulate in cells. The last step in glycolysis is catalyzed by pyruvate kinase. The pyruvate produced can proceed to be catabolized or converted into the amino acid alanine. If no more energy is needed and alanine is in adequate supply, the enzyme is inhibited. The enzyme’s activity is increased when fructose-1,6-bisphosphate levels increase. (Recall that fructose-1,6-bisphosphate is an intermediate in the first half of glycolysis. ) The regulation of pyruvate kinase involves phosphorylation, resulting in a less-active enzyme. Dephosphorylation by a phosphatase reactivates it. Pyruvate kinase is also regulated by ATP (a negative allosteric effect). If more energy is needed, more pyruvate will be converted into acetyl CoA through the action of pyruvate dehydrogenase. If either acetyl groups or NADH accumulate, there is less need for the reaction and the rate decreases. Pyruvate dehydrogenase is also regulated by phosphorylation: a kinase phosphorylates it to form an inactive enzyme, and a phosphatase reactivates it. The kinase and the phosphatase are also regulated. The citric acid cycle is controlled through the enzymes that catalyze the reactions that make the first two molecules of NADH. These enzymes are isocitrate dehydrogenase and α-ketoglutarate dehydrogenase. When adequate ATP and NADH levels are available, the rates of these reactions decrease. When more ATP is needed, as reflected in rising ADP levels, the rate increases. α-Ketoglutarate dehydrogenase will also be affected by the levels of succinyl CoA, a subsequent intermediate in the cycle, causing a decrease in activity. A decrease in the rate of operation of the pathway at this point is not necessarily negative as the increased levels of the α-ketoglutarate not used by the citric acid cycle can be used by the cell for amino acid (glutamate) synthesis. Citric Acid Cycle: Enzymes, isocitrate dehydrogenase and α-ketoglutarate dehydrogenase, catalyze the reactions that make the first two molecules of NADH in the citric acid cycle. Rates of the reaction decrease when sufficient ATP and NADH levels are reached. Specific enzymes of the electron transport chain are unaffected by feedback inhibition, but the rate of electron transport through the pathway is affected by the levels of ADP and ATP. Greater ATP consumption by a cell is indicated by a buildup of ADP. As ATP usage decreases, the concentration of ADP decreases: ATP begins to build up in the cell. This change in the relative concentration of ADP to ATP triggers the cell to slow down the electron transport chain. 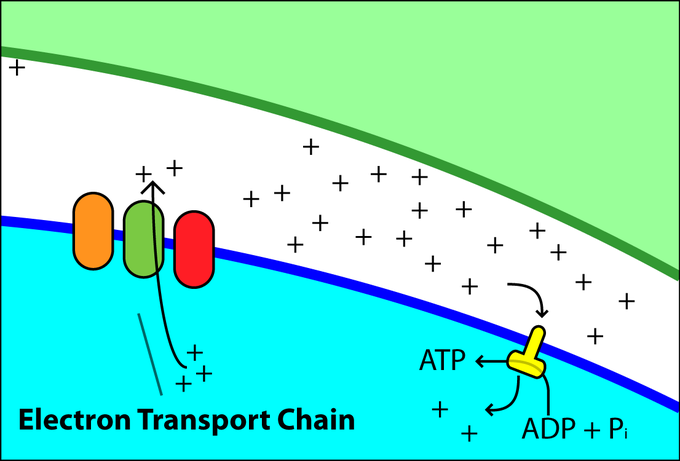 Electron Chain Transport: Levels of ADP and ATP affect the rate of electron transport through this type of chain transport.